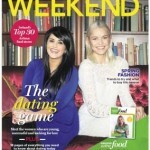 Irish Independent Weekend Magazine 16th January 2016. The Dating Game. Maria in conversation with Claire O’Mahony. Maria suggests not having a fully rehearsed approach and prepared topics of conversation, which may have you sounding like a robot, and to show genuine interest in what the other person has to say, while keeping your body language open with eye contact and a natural smile. If you are feeling awkward, she suggests acknowledging it out loud and making fun of it. “In my opinion The most important thing is to stay genuine, warm hearted and to show respect for yourself and the other person. If all fails, still congratulate yourself as you are taking action and getting out there which is a big part of building your confidence,” she says.